On the brink of bankruptcy, Alaska travel agent Paul Barnell (Academy Award® Winner* Robin Williams, Good Will Hunting) cooks up a scheme to pass off a dead body as his long-lost brother, Raymond (Academy Award® Nominee** Woody Harrelson, Three Billboards Outside Ebbing, Missouri), and then collect on his life insurance. But unfortunately, the investigator isn't buying the scam, the hit men responsible for the body want it back -- so they kidnap Paul's Tourette's afflicted wife Margaret (Academy Award® Winner*** Holly Hunter, The Piano) -- and, to top it all off, Raymond shows up demanding a piece of action. So much for easy money! 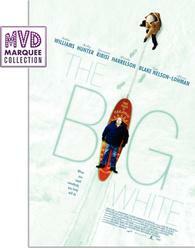 From writer Collin Friesen ('Schitt's Creek'), acclaimed director Mark Mylod ('Game of Thrones') and a score by rock legend Mark Mothersbaugh (Devo, Thor: Ragnarok) The Big White boasts an all-star supporting cast that includes Giovanni Ribisi (Avatar), Tim Blake Nelson (The Ballad of Buster Scruggs) and Alison Lohman (Drag Me To Hell) in the dark comedy that has ''slapstick laughs, surprising warmth and star wattage. '' (Total Film).